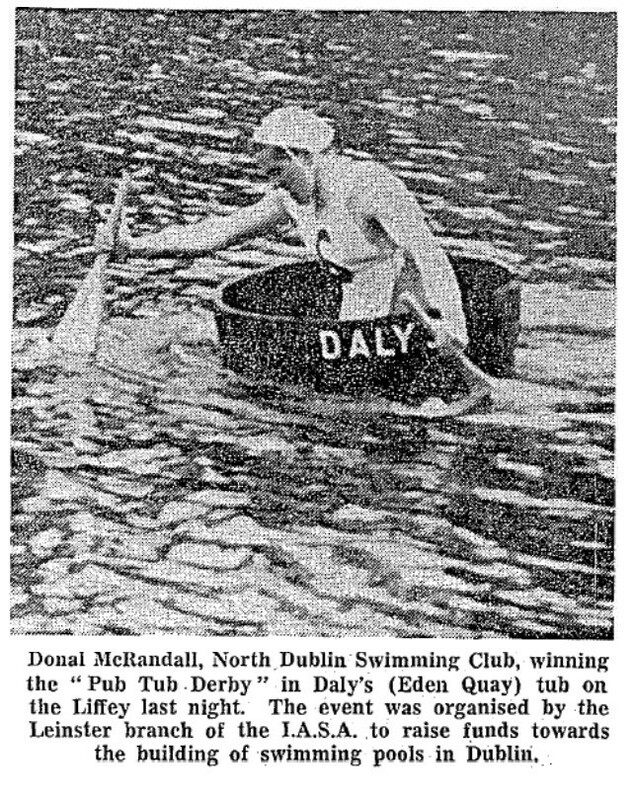 The weird and wonderful ‘Pub Tub Derby’ of 1960s Dublin. | Come Here To Me! The weird and wonderful ‘Pub Tub Derby’ of 1960s Dublin. Following up on Sam’s post drawing attention to the fact a huge archive of rare archival video footage has just been uploaded onto YouTube, I was particularly struck by the wonderful madness of one clip in particular, entitled ‘Publicans Take To Water’. The clip shows huge crowds gathering along the Liffey to watch the ‘Pub Tub Derby’, a curious event in the city in the 1960s which aimed to raise funds for the construction of new swimming pools in the city. The sponsors of the race comprised eleven well-known Dublin publicans. The tubs used for the event were formerly Guinness stout barrels and bore the names of the respective pubs on them. The course was between Capel Street Bridge (Grattan Bridge) and O’Connell Bridge. The winning pub received the Guinness Perpetual Trophy, presented by Arthur Guinness & Sons (Dublin) Ltd. Individual prizes were awarded to the ‘pilots’ of the first four tubs past the finish line. Music on the liffey: A screenshot from the clip. News coverage of the Pub Tub Derby, 1966. While jumping into the Liffey remains popular today, especially among the kids who gather at the docks, swimming up it in discarded Guinness barrels has been relegated to history. These kind of little tidbit videos make a great addition to YouTube.